My daughter Hattie was diagnosed with a rare form of cancer called botryoid rhabdomyosarcoma in July 2013 when she was 16 months old. After about a year and a half of chemotherapy, radiation and multiple surgeries, she was declared cancer free in December 2014. I'm posting a photo and short reflection every day in 2015 to celebrate the end of treatment and reflect on the journey. 17. 8/6/2013 - First chemo pt. 1. The day arrived and we arrived at Dana-Farber Cancer Institute's The Jimmy Fund Clinic and went through all the steps that would soon be commonplace. You first check in at the desk and get an ID badge (Hattie liked in on her ankle usually). Then you wait for awhile in the waiting room before being called back to get vital signs like weight, height, blood pressure and blood oxygen levels. Then it's back to the waiting room before being called back for the really really fun act of placing a needle through the skin into the port-a-cath. We placed a skin numbing cream called EMLA over Hattie's port that helps alleviate the pain of needle accessing. The accessing process was pretty tough the first few times as we really had to hold her down while the nurse accessed the port, verified blood return and then placed Tegaderm dressings to keep the needle in place. The nurse then collects a few different blood samples for various blood tests. After the accessing and blood draws, it was back to the waiting room for a bit before being called in to meet with the oncology fellow for an exam and talk about the treatment plan. Then the attending oncologist comes in for an exam and talk and then we're on our way to the infusion clinic. Once at the infusion clinic, you check in and then (surprise) wait a bit until the blood counts OK and orders to proceed with chemo go through. Then you head on back to an infusion space and get the port hooked up to an IV pump to start various medications and fluids and ultimately, chemo. For Hattie's first chemo, we were checked into a private room. 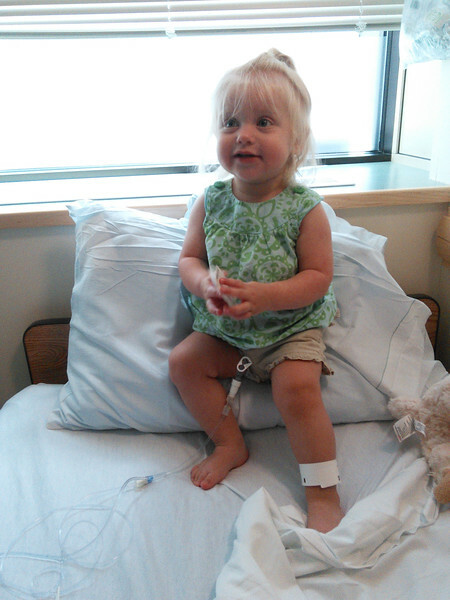 Hattie was getting the full three VAC chemo medications and required to be properly hydrated before chemo could start. That meant flushing her with hydrating IV fluids and checking the specific gravity of her urine whenever she had a full diaper. Our main infusion nurse Caitlin quickly dubbed Hattie "The Camel" for her uncanny ability to hold in copious amounts of IV fluid, leading us to wait hours before starting chemo!